“Illumination” at The Morton Arboretum in Lisle, Illinois, just outside of Chicago, is a unique interactive holiday light experience where trees become a dynamic living canvas. Created by visual design group Lightswitch and hailed for its creative use of lighting, including Elation LED PAR lights, “Illumination” is a whole new way to experience the Arboretum in winter and has proved a magnificent way to draw more visitors there in winter months. A nonprofit outdoor museum where over 4,100 different species of trees and other plants are highlighted in special landscaped areas, the collection is brilliantly illuminated using over 300 Elation Level Q7 IP PARs, among other luminaires, provided by Chicago-based lighting equipment supplier Intelligent Lighting Creations (ILC). Working with our partner ILC, Lightswitch transformed the park into a sensory guest experience. 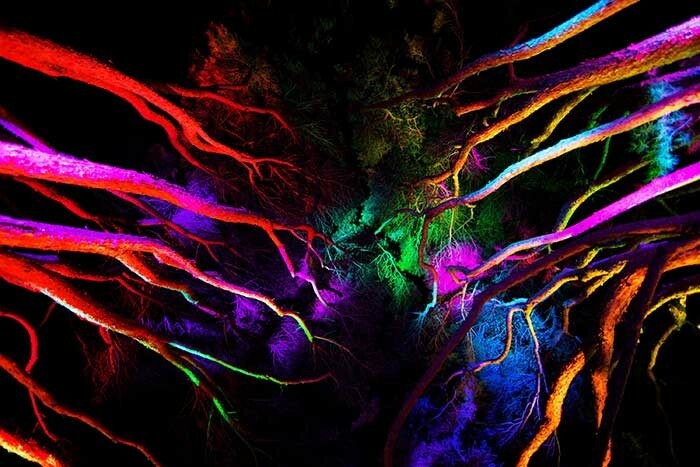 “Illumination” takes place along a mile-long walk, engaging the senses with dramatic uplighting and enchanting color-changing illumination, voice- and motion-controlled lighting installations, video projections and much more. A few of the interactive delights include illuminated trees that change color when hugged or sung to, and trees that interact with light and color with a swipe of the hand. ILC mocked up about five different fixtures from various manufacturers and ultimately settled on the Elation Level Q7 IP, an IP-65 rated 15W RGBW LED PAR. “The Q7 IP outperformed all the other fixtures we looked at in this price point,” Matt says. Although ILC ended up adding fixtures to the overall count in order to double up fixtures in areas where the original spec called for larger format LED fixtures, the 300 individually addressable LED fixtures consume about the same amount of power as a typical home. 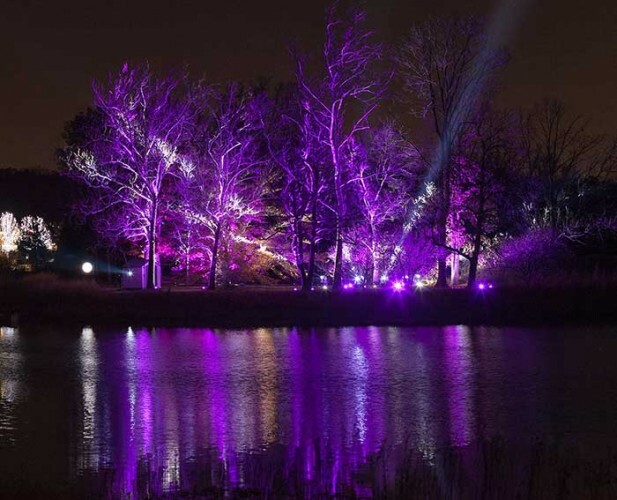 Visitors can experience “Illumination” at The Morton Arboretum most nights until January 4, 2014. Photos: The Morton Arboretum and Benjamin Roy.